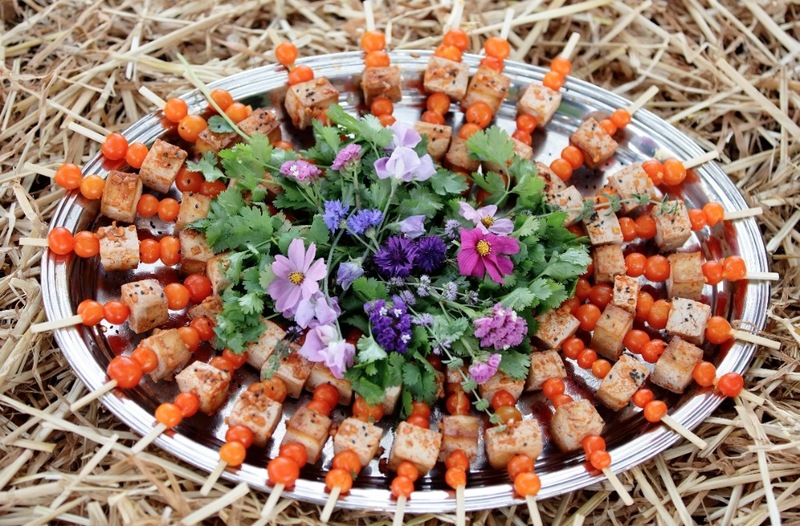 Colectivo Felix, led by chef Diego Felix and his wife Sanra Ritten, is doing an on-farm dinner this Saturday, June 24, at Monkeyflower Ranch in Royal Oaks (near Watsonville). The meal will feature dairy and meat from Garden Variety Cheese and Monkeyflower Ranch, plus produce from Tomatero Farms and wine from Beauregard Vineyards. See menu below. It’s part of a farm dinner series featuring local organic farms and pairings with local ciders and wines. Online tickets are $75 for food only and $100 with wine. Diego, Sanra and their kids moved to Santa Cruz County last fall to help with the opening of HOME. Sanra’s sister is Linda Ritten, Home chef Brad Briske’s wife. Colectivo Felix utilizes HOME’s kitchen and garden for some of their events. Diego is originally from Argentina. Occasionally, HOME’s menu selections reflect South American influences (including a beef tongue empanada with green tomato chimichurri and plum chutney that I enjoyed during a December visit). In May Colectivo Felix began a four-month dining tour (unique dinner parties in Washington, D.C., New York, SF and Santa Cruz/Soquel). 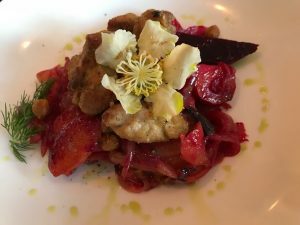 I had the pleasure of attending a Colectivo Felix pop-up dinner at Soquel’s HOME Restaurant in May and meeting Diego and Sanra, who are gracious, humble and warm. The prix fixe meal was exquisite; chef Diego really knows his flavors. Highlights included goat cheese and peach filled torta fritas; baby beet and carrot escabeche with seared sweetbreads and fried garbanzos (an indescribably wonderful combination); and lamb empanadas with chimichurri aioli. When Diego talks about how much he loves creating good food, his whole face lights up and his passion is contagious, making the dining experience even better. I hope to enjoy another Colectivo Felix meal in the not-too-distant future! 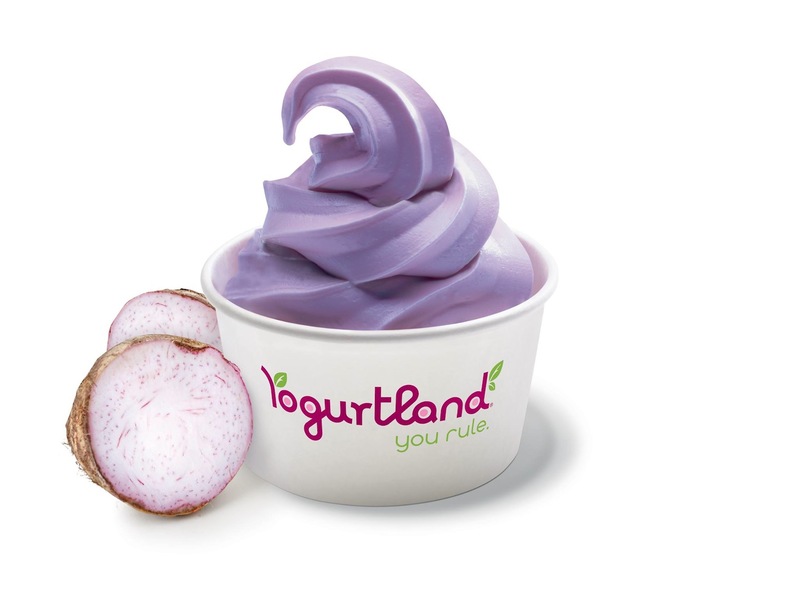 It’s National Frozen Yogurt Day on Feb. 3, 2014, and Yogurtland — including the nearby locations in Capitola and Watsonville — are giving out free yogurt! Here are the specifics: the promotion is from 4-7 p.m. on Monday, Feb. 3. Visitors to Yogurtland shops get free yogurt and toppings. Remember: frozen yogurt not only tastes good, it’s got benefits like calcium and probiotics. Bon Appetit! Second Harvest Food Bank is having a kickoff lunch for its annual holiday food drive on Nov. 13 in Santa Cruz. The event is at the Cocoanut Grove from 11:30a.m. – 1p.m. The lunch will be a buffet, and the program will include the event’s co-chairs speaking about why they are involved with Second Harvest. Tickets are $25; purchase online. For more information, email bly@thefoodbank.org or call (831) 722-7110, x226. People are encouraged to attend this lunch to find out how they can help this holiday season. Distribution at Second Harvest Food Bank of Santa Cruz County has increased by 32% in the last five years. Second Harvest needs donations of time, money, and food – what a great way to give back this holiday season! Second Harvest Food Bank (831-722-7110, located in Watsonville) distributes several million pounds of food per year to local families, children, individuals and seniors in our community through over 180 agencies and programs. The organization helps 55,000 people each month. You can donate online — every $1 you give becomes four healthy meals that Second Harvest can distribute, and these meals include fresh fruits and vegetables. Founded in 1972, Second Harvest Food Bank Santa Cruz County was the first food bank in California and is the second oldest in the nation. 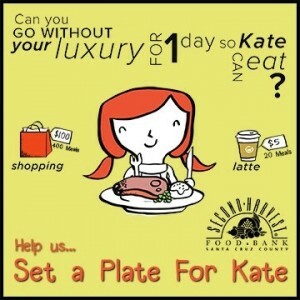 It began by distributing food from a parking lot in Santa Cruz to groups operating the Breakfast For Kids programs. Second Harvest’s current campaign is themed “Set a Plate for Kate.” The campaign messaging includes the idea that if certain people gave up their “luxury items” even for one day, a lot of hungry people could be fed. For example, by skipping a $5 latte you could purchase 20 meals for Second Harvest, and instead of going out to a $50 restaurant dinner, if you gave the money to Second Harvest this would provide 200 meals! That is some serious food for thought. Second Harvest Holiday Food Drive Kickoff Lunch, Nov. 13 11:30a.m. – 1p.m. Live Earth Farm is hosting its fourth annual Dig! 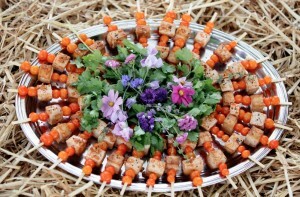 farm dinner in the fields to benefit LEFDP (Live Earth Farm Discovery Programs). The event features local chefs including Jonathan Miller (a popular chef at local school Let’s Cook! as well as a private chef and caterer), plus several farmers and artisans. The program is from 4-8 p.m. on Saturday, September 22. Tickets are $150 and include food and wine. Purchase tickets online or make a donation of any amount to LEFDP, even if you can’t make the event. The evening starts with appetizers and a tour of Live Earth Farm given by Tom Broz, the head of the family that operates the farm. Then there will be a four-course dinner — which includes wine from Storrs Winery, Birichino, Pleasant Valley Vineyards, Zayante Winery, and Cima Collina –followed by dessert which takes place in a renovated redwood barn. Another fun component of the event is a silent auction with lots of locally themed prizes such as a gift certificate for a workshop by fabulous food preservationists Happy Girl Kitchen Co. The nonprofit education organization LEFDP teaches local youth about sustainability, organic agriculture, community, and the environment through farm visits, summer programs, workshops, and other hands-on activities. Over the course of 2012, LEFDP will support a diverse group of approximately 1,500 students, including low-income individuals from Santa Cruz, Santa Clara, and Monterey counties. 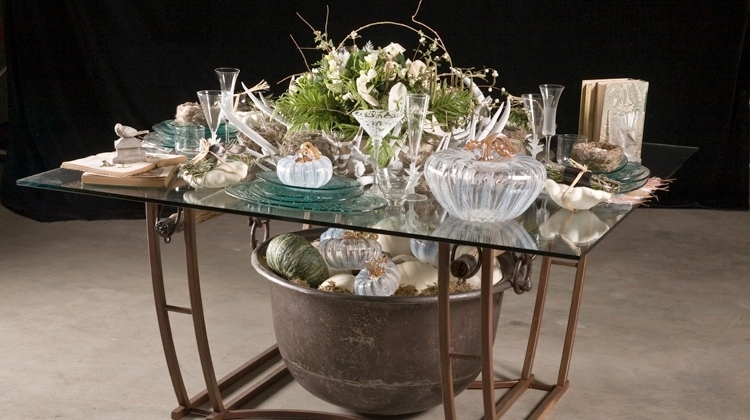 The Annieglass Watsonville studio has been hosting a Saturday summer food and wine series, which has occurred on most – but not all – Saturdays this season. You have just a few more opportunities to enjoy it (the series began in May and ends August 25). The events take place from 12-4 p.m. at 310 Harvest Drive. Each one focuses on a different artisan food vendor and/or a different winery. The August highlights are below. Also note that every weekend, from Friday through Sunday, Annieglass in Watsonville now offers “Pours & Tours.” The free 20-minute studio tours are at 11:30 a.m. and 2:00 p.m. Wine tasting of Santa Cruz and Monterey County wines is available from 12:00-4:30 p.m. each day. The cost is $5 for 3 wine tastings or $8 for 6; if you buy a bottle the tasting fee is waived. Call (831) 761-2041 for more information. Enjoy tastings of Pacific Crest Apiaries honey and wildflower bee pollen. Pacific Crest will be featuring some of their raw, hand-processed honey around and a selection of hand-crafted pure beeswax candles. If you’re unfamiliar with Garden Variety Cheese, you’re in for a new and wonderful treat. Rebecca King runs a sheep ranch and only feeds the animals organically raised, irrigated pasture and organic brewer’s grain from Santa Cruz Mountain Brewing. The result is great-tasting milk and then, delectable cheese. Scotts Valley-based Bruzzone Family Vineyards specializes in Chardonnay and Pinot Noir. Jen Ashby is an amazing Aptos-based chocolatier; you’ll love the goodies she creates with seasonal ingredients for Ashby Confections. 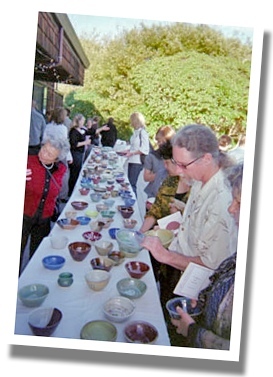 Empty Bowls, an annual dinner and auction featuring gourmet soup, wine, and more, benefits Pajaro Valley Loaves & Fishes. The event takes place from 5-9pm on Saturday, October 15, 2011. Tickets are $60 and available online or by calling Loaves & Fishes Executive Director Margarita Cortez at (831) 722-4144. This is the eight annual Empty Bowls. Local artists have generously donated nearly 100 one-of-a-kind handmade bowls. Each dinner attendee selects a bowl of his or her choice to take home, and the gets to feast on gourmet soup, salad, bread, and dessert. Beverages include wine (donated by vendors such as Soquel Vineyards and Alfaro Family Vineyards & Winery) and sparkling cider. At Empty Bowls there will be live music by the Minor Thirds, plus live and silent auctions and a raffle. Live auction items include a cooking class for four led by Mimi Snowden (a renowned cooking teacher, restaurateur, and restaurant designer) and a week-long stay at Pajaro Dunes. Other prizes include golf, artwork, and wine tastings. 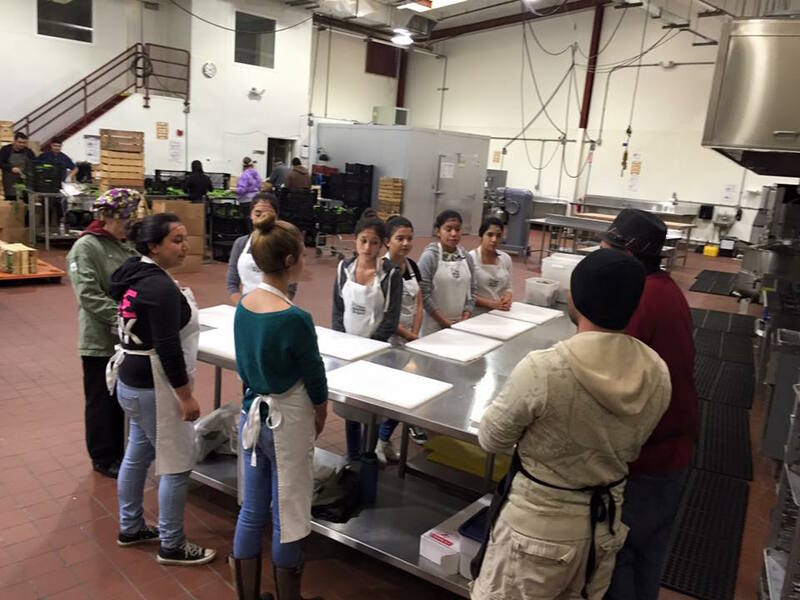 About the beneficiary organization: Loaves & Fishes is a community-supported food pantry and kitchen in Watsonville; services include providing a hot mid-day meal Monday through Friday every week of the year. Loaves and Fishes was founded in 1989; it helps people in need including migrant farm workers, poor working families, and individuals who are disabled, homeless, or elderly. In the last 4 years the organization has had increased numbers of people using its Food Pantry grocery program (up by 100%) and its Hot Lunch program (up by 60%). Loaves & Fishes raises 20% of its annual budget through Empty Bowls; if you’d like to help out in this time of great need buy your Empty Bowls ticket today or donate directly to Loaves and Fishes. Dining out on Mother’s Day is a fun way to honor a great mom, and Santa Cruz has many restaurants offering special menus this Sunday. 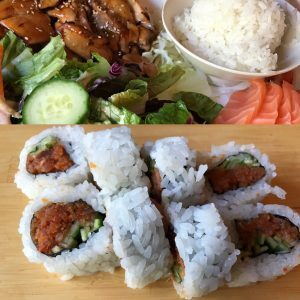 See Part 1 for more restaurants in the Santa Cruz area, one in Half Moon Bay and one in Glen Ellen, and see below for the second and final group of restaurants I am highlighting. Happy Mother’s Day! 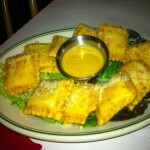 Ristorante Italiano is serving Mother’s Day dinner beginning at 4pm on Sunday. The restaurant is offering a free tiramisu with dinner. Call (831) 458-2321 for reservations. Aptos restaurant Bittersweet Bistro is serving Mother’s Day champagne brunch from 9am-2pm. The buffet includes Strawberry-Chipotle Glazed King Salmon, Greek Style Roasted Leg of Spring Lamb, Bourbon Glazed Corralitos Ham, Bittersweet Grand Marnier French Toast, Classic Eggs Benedict, Made to Order Omelets, Housemade Scones, Croissants & Muffins, Beet Salad, and Tomato Mozzarella Salad – plus a dessert extravaganza including chocolate fountains. There will be a special kids’ table with Grilled Cheese, PB & J Sandwiches, Chicken Fingers and Cookies. The price is $52 Adults, $18 Children 6-12, and $5 Kids Five and Under. For the 9:00 a.m. seating only, receive a $10 discount per adult. Call (831) 662-9799 for reservations. If you plan to go to Sushi Garden for Mother’s Day lunch or dinner, be sure to pick up this week’s Good Times. On page 26 there’s a coupon for a free roll on Mother’s Day, good on lunch orders of $20 or more and dinner orders of $40 or more. It’s good at both locations. The Chaminade offers its annual Mother’s Day Brunch Buffet from 9am-3pm; the price is $49.95 (adults), $17.95 (kids 6-12), and free for kids under 6. Call (831) 475-5600 for reservations. Mother’s Day brunch specials include candied walnut waffles ($9), Monterey Bay Eggs Benedict ($14), and $4 bloody marys and mimosas. Brunch is from 9am-3pm; call (831) 476-2733. The supermarket’s Santa Cruz location offers Mother’s Day Brunch on Sunday from 10am-noon. Breakfast foods like cage-free eggs, fresh pastries and more will be available for $2 each. And Moms get free coffee from 8am-noon on Mother’s Day! Call (831) 426-9901 for more information. Hoffman’s, located in downtown Santa Cruz, is serving Mother’s Day brunch and dinner. The restaurant is featuring its regular menus plus specials during both meals. Call (831) 420-0135 for reservations.